“War for the Planet of the Apes” is a searing, intense, and emotional conclusion to the story of Caesar and the new “Planet of the Apes” reboot trilogy. With this final chapter, these films have achieved a level of artistic and storytelling brilliance unmatched by any other franchise in the 2000s—or any franchise ever for that matter. 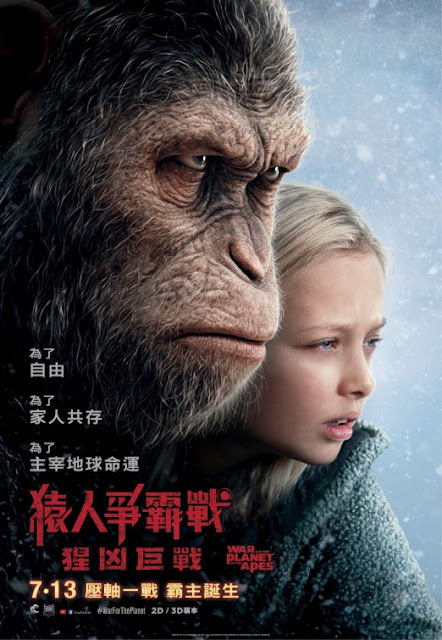 “Rise of the Planet of Apes”, directed by Rupert Wyatt and written by Rick Jaffa and Amanda Silver, was a late summer August release in 2011 that took everyone by surprise with its heartfelt “E.T.” meets “Escape From Alcatraz” storyline anchored by a knockout performance from Andy Serkis as Caesar. Director Matt Reeves and his writing partner Mark Bomback took over the franchise for 2014’s “Dawn of the Planet of Apes” and created an epic, Shakespearean Godfather-ish drama that stands as one of the all-time great sequels, acclaimed by critics to be in a class with “The Godfather II” and “The Empire Strikes Back”. Part threes of any series are always are an uphill battle and following “Dawn” seemed to be an impossible task. Reeves and Bomback returned but vowed they would only make the movie if it broke new ground and was even better than its two outstanding predecessors. And guess what? They did it. They brought the Apes trilogy to a visceral, heart-breaking, emotionally rich conclusion, and created a modern cinema masterwork in the process. As was the case in the previous entries, the movie is a mix of classic films and genres. This time it is the western that Reeves draws upon the most, particularly the revenge western, as well as biblical epics, war movies and the prison camp sub-genre. Reeves has mentioned “The Outlaw Josey Wales” and “The Bridge on the River Kwai” in interviews. 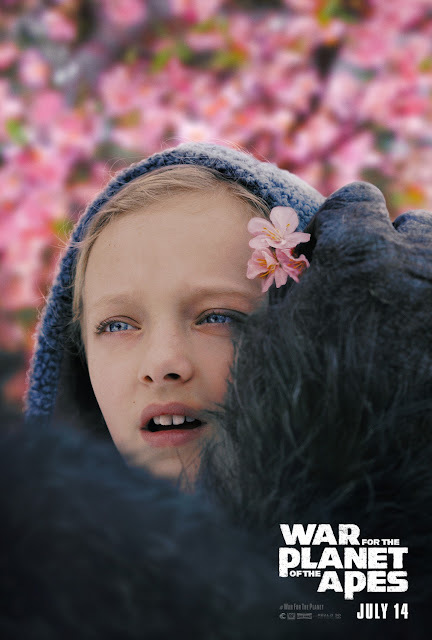 The latter being of special note because “Kwai” was directed by the legendary David Lean and “War for the Planet of the Apes” (shot in the sumptuous Arri Alexa 65mm format) looks very much like a David Lean film—almost as if David Lean were directing a spaghetti western. And then there is the score—that utterly amazing sonic soundscape created by composer Michael Giacchino. It is a soundtrack that is in many ways as avante-guard in today’s super-restrained film scoring environment as Jerry Goldsmith’s classic score was for the original in 1968. And even though much of the score is atonal, and even experimental in parts, it packs an emotional wallop when Giacchino gives us his heart-breaking melodies during the intensely emotional scenes. But as technically brilliant as this movie is, it is about so much more than knockout cinematography, haunting production design, movie homages, and an instantly classic soundtrack. This film is about Caesar’s long, winding, often painful, journey, and the journey of the people he leads. People he once freed from the captive cruelty of humans—a captive cruelty they once again find themselves facing in this movie at the hands of a sadistic Colonel (a brilliant and disturbing Woody Harrelson). In the face of this new danger and tragedy, we see many of the characters grow, including Maurice, Rocket, Lucca, Lake, and two fantastic new characters—“Bad Ape” played by Steve Zahn, and a Nova, a young human girl who reminded me of a young Dakota Fanning. There is a scene between Nova and Caesar in this film that packs more emotion that a hundred films. It will break your heart, and it will inspire you. 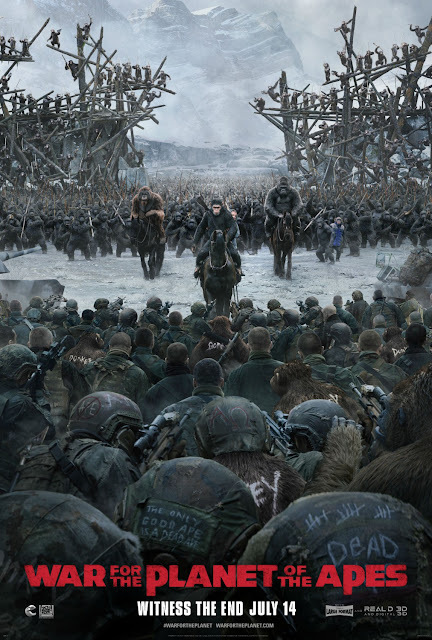 Botttom line: “War for the Planet of the Apes” is a part three that defies the odds and brings the trilogy to an unforgettable, emotional conclusion. A masterpiece and the best film of 2017 by a mile.